Appmon (アプモン, Apumon), short for Appli Monster (アプリモンスター, Apuri Monsutā), are digital creatures that are based on smartphone apps. Possessing artificial intelligence, being able to think and act independently, they are "app lifeforms" that were born within the boundary between the Real World and digital space, lurking within the Net Ocean. Appmon share several similarities to Digimon but have specific features exclusive to them. There are many different species of Appmon; there exists as many Appmon as there are apps. In the Real World, Appmon exist in the form of an Appmon Chip, and are able to appliarise from them through the use of a device such as the Appli Drive. They also each have two retractable Plugs attached to them, which they use to applink with other Appmon. Appmon evolve via AppGattai (アプ合体, Apugattai; lit. "App Fusion"). This occurs if Appmon applink in a specific combination. AppGattai can sometimes result in failure; the failed AppGattai of two Standard-grade Appmon will result in forming Sukasimon, of two Super-grade Appmon, Damedamon. Like Digimon, Appmon species are also given several different classifications. 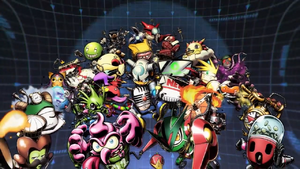 Although some of the parameters used to classify them differ from those used for Digimon, they can be seen as equivalences. Appmon represent different type of apps, possessing the abilities of those apps. They each have a unique icon called an "Appli Icon" (アプリアイコン, Apuri Aikon), similar to the app icon on smartphone, displayed on the back of their Appmon Chips. This page was last modified on 25 September 2017, at 11:32.